Most employers of college graduates in the music business look for hires who have some experience in the field, so it makes sense to secure an internship while in school or right after graduation. Creating an effective resume that showcases relevant skills and knowledge will be a critical step in landing a solid internship. Before starting to compose your resume, take an inventory of your skills and experiences from all aspects of your background, including academic projects, campus and community activities, jobs, internships, and independent pursuits. If you haven’t been active in the field, volunteer to help on campus with organizations like the radio station, campus concert and entertainment committees, or the music department. Consider managing student bands, assisting in the campus recording studio, or covering the music scene for the campus newspaper. Emphasize social media marketing functions in these roles whenever possible, given how highly these skills are valued in the music industry. Consider creating a music-related blog and marketing it to all your friends. For each description on your resume, start your phrase with a skill or action term. In the music industry,the following are common skill terms: promoted, organized, created, marketed, publicized, composed, orchestrated, managed, devised, pitched, negotiated, presented, planned, fund-raised, arranged, facilitated, and conducted. Be sure to reference any situations where you were able to influence others to action, such as attracting an audience for an event, generating donations for a cause, recruiting volunteers to help with a project or to join a fraternity or sorority, selling a product or tickets, or attracting a following for an online media site. Whenever possible, show your achievements with numbers. Sold 200 tickets for a coffee house concert. Recruited 15 new members for a fraternity. Increased advertising sales by 15%. 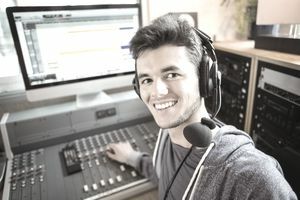 Include a skills section on your resume to highlight your technical skills in musical recording or performance, social media, marketing, and computers. Carefully proofread your document and consider having it reviewed by an adviser or someone with an eye for detail. If you need assistance, take advantage of your campus career office for help in creating your resume and cover letter. Engineered sessions; transcribed music; programmed drums; tracked and comped vocals; mixed sessions in Protools HD for Grammy Award-winning song writer and producer. Created Do-It-Yourself version of The Virtual CD, drastically lowering administrative costs of serving new clients. Upgraded Flash Application in ActionScript and developed application back-end in Jamroom Content Management System (PHP / MySQL). Devised and implemented social media marketing strategy for a local contemporary clothing boutique. Developed platform-independent E-Commerce website on Drupal Content Management System. Created Joomla-based Social Network with features including micro-blogging, messaging, news, events, and viral invites. Grew membership to over 600 users. Developed and designed all-college communications material; such as billboards, brochures, and websites. Grew music production company into successful profit-generating enterprise - overseeing overall management functions including budgeting, operations, and promotions. Administered budget and inventory; explored new markets; repaired computers and liaised with suppliers. Increased business significantly within first 3 months.